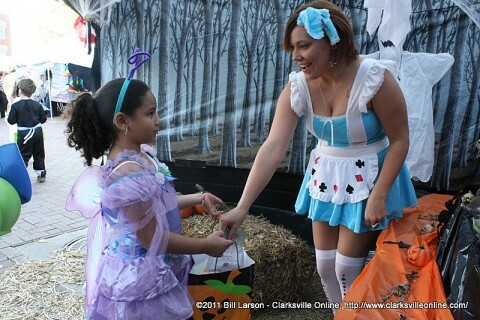 Clarksville, TN – On October 31st, the residents of the City of Clarksville turned out to enjoy the Halloween festivities. On Madison Street, the Mobley-Seifried family was out Trick or Treating, when I caught up with them at the Williams House where Paisley (5), Crispin (4), and Alessandra (9) were singing the Halloween song for Mark Williams and the neighbor son John (6). Murfreesboro, TN – Lettie Kendall, a Montgomery County commissioner, has been selected as the 2011 recipient of the “Robert M. Wormsley Outstanding County Official of the Year” award by the Tennessee County Services Association (TCSA). Kendall, a county commissioner for the past 39 years, joins the ranks of only seven other county officials ever to be awarded this prestigious title by the statewide association. She is the first female and first African-American to win the distinguished award. 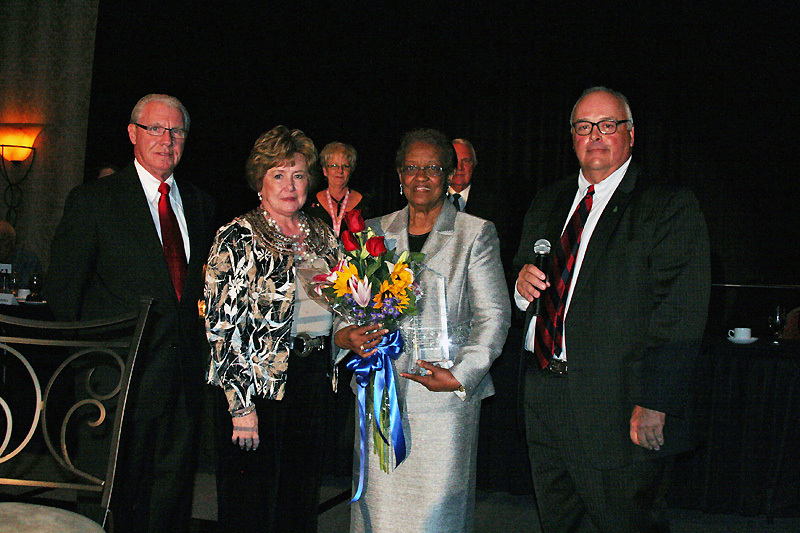 Pictured are left to right: Bob Wormsley, Mayor Carolyn Bowers, Lettie Kendall and Kevin Huffman, Gibson County Mayor. Gulf Shores, AL – The late fall season struggles continued for Austin Peay State University women’s golf team, Monday, at the UAB Fall Beach Blast, being played at the at the Peninsula and Racquet Club. 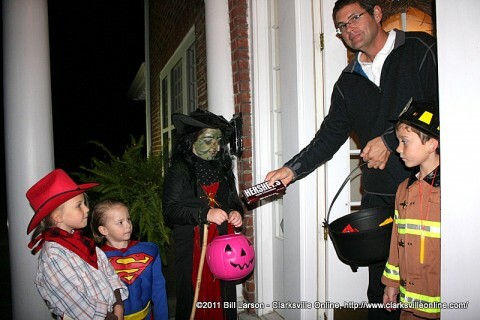 Nashville, TN – A Clarksville city councilman has been appointed to a state board by Governor Bill Haslam. It was announced today that Ward 1 councilman Nick Steward has been appointed to The Tennessee Pest Control and Licensing and Advisory Board. Brentwood, TN – Austin Peay State University’s volleyball team swept the adidas Ohio Valley Conference’s Player of the Week honors, the league office announced, Monday. Junior outside hitter Nikki Doyle earned the league’s offensive award, senior libero Paige Economos was named the defensive award winner and freshman setter Cami Fields picked up the conference’s setter honor. 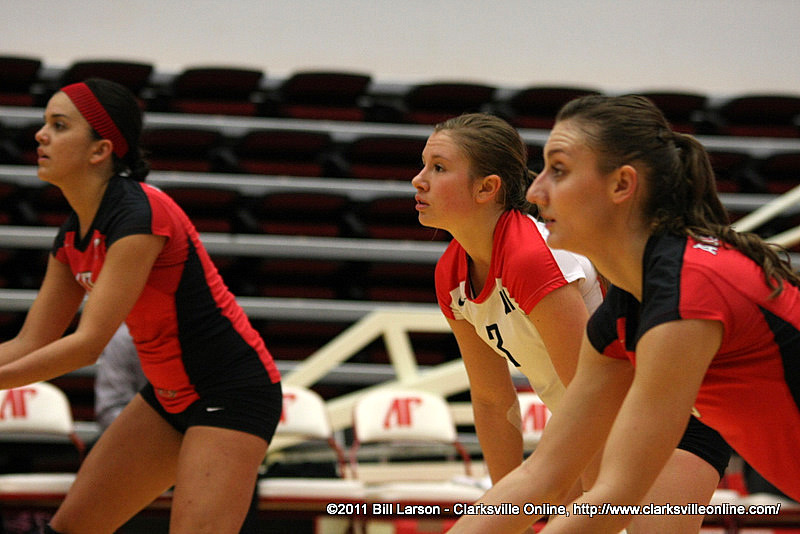 (L to R) Ilyanna Hernandez, Paige Economos and Nikki Doyle ready for the Jacksonville State serve during Saturday afternoons contest. 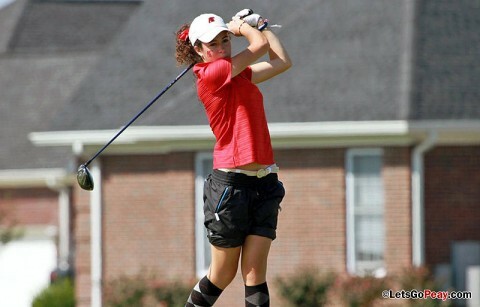 Lady Govs went on to win in four sets. Greenbelt, MD – A late October snowstorm from a Nor’easter blanketed the eastern U.S. from West Virginia to Maine and broke records the weekend before Halloween Monday. NASA’s Aqua satellite flew over the region on October 30th after the snow was ending in New England and captured the ghostly blanket of white. A high pressure area located over southeastern Canada was responsible for bringing in cold air and that combined with a low near the North Carolina coast this weekend. 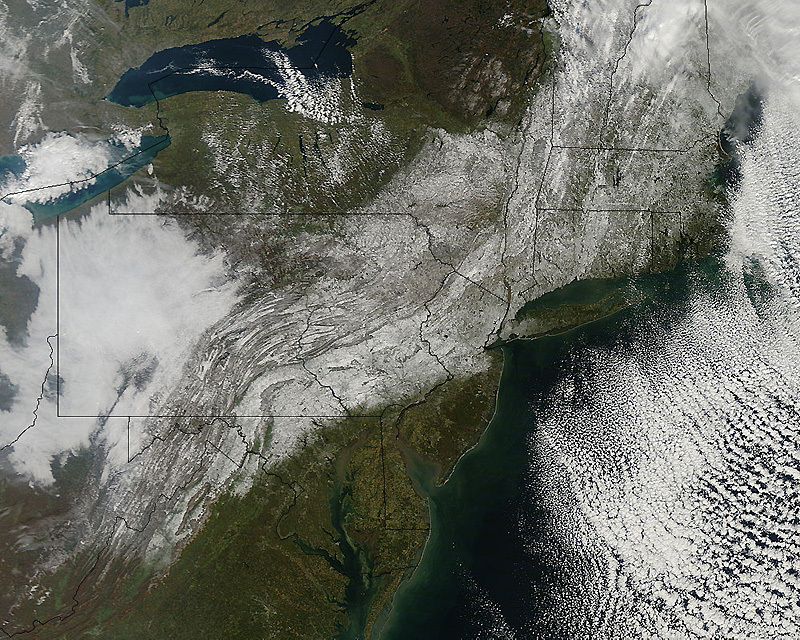 The result was an unusual snowstorm from West Virginia to Maine. 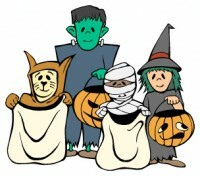 The rapidly growing event has become a don’t miss Halloween activity. 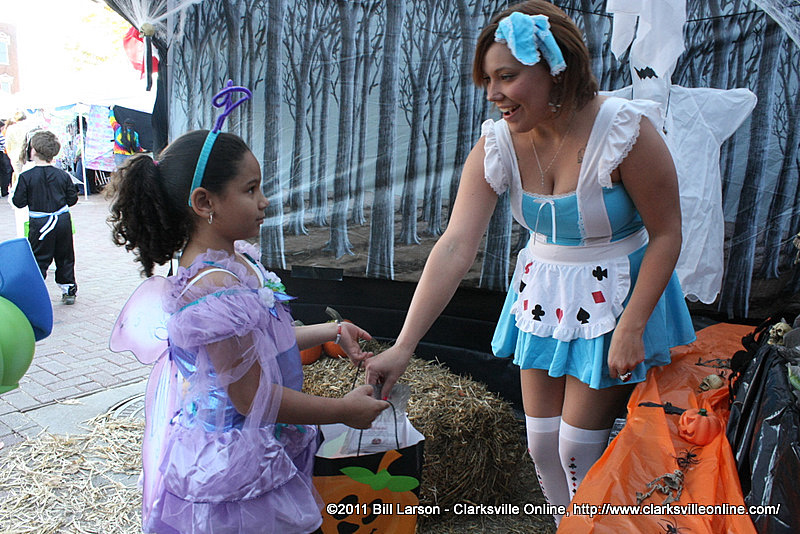 Area businesses line the streets in Downtown Clarksville distributing Candy and information to costumed children and their parents. Clarksville, TN – American Freight Furniture and Mattress is excited to announce the opening of its newest store in Clarksville, Tennessee. Situated at 2231-B Madison Street, the Clarksville location marks American Freight’s third store in Tennessee, with two others in Nashville and Chattanooga. 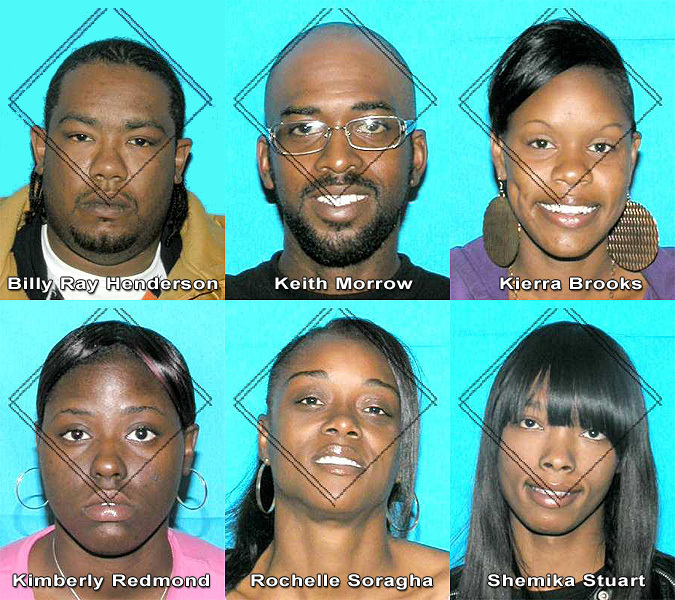 Clarksville, TN – Since the end of September 2011, six thieves have bilked a Fort Campbell Boulevard business out of over $10,000 in cash through the use of fraudulent payroll checks. Officer Christina Gilliard has been investigating the case and determined the payroll checks were written on an account for New Adult Assisted Living, 1795 Cornelia Lane, Memphis, TN 38117. Clarksville Police are looking for these six suspects. Clarksville, TN – You’re invited to join the merchants of Historic Downtown Clarksville for The monthly Art Walk, on November 3rd, from 5:00pm–8:00pm.